the solar panel set up is 45 watt and it is the harbor freight thunderbolt magnum 45 Watt Solar Panel Kit 10 Pc Kit. If the panels ever fail i will just upgrade the panels to more modern type and proably still use the ok charge controller that came with the harbor freight set up. Hi and welcome to our forum. That's quite a wall of words to digest all at once. Questions are great! We love to help and we are eager to answer yours. That said, for best results, rather than giving a long list of questions, please break them down individually and send them in small, bites sized posts. The battery isolator is just 3 big diodes potted in epoxy, one for each battery. Like any diode there's a voltage drop, and when you push that much power through them there's going to be heat and some power loss. Also because of the voltage drop your batteries don't get a full charge without setting up your alternator accordingly. You do this by connecting the "sense" wire to one of the battery terminals of the isolator. Which one is up to you, and that's the one the isolator will "read". I don't know how or if you can do this with a one-wire alternator, or with solar. MOST solar charge controllers take their power from the battery. However the diodes in the isolator won't allow this, and you might not be able to use your charge controller with the isolator. It will depend on your controller. Considering the price I'd check it to make sure it's still good. I imagine you can use a multimeter, or an alternator shop could probably do it. 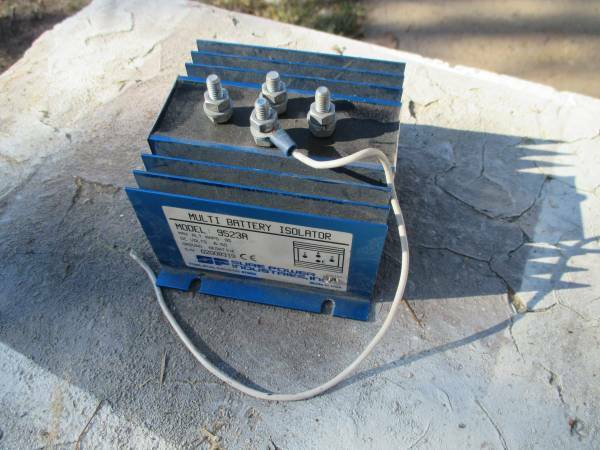 Battery isolators are considered old technology though they still work and folks still use them.
" (scooter runs 3 12v batteries in series at 36volts and i usually use a AC 110v wall charger for charging them from my house that charges while still in series). " I would get a second scooter charger (~ $12 - $13 on eBay), crack open the case, measure the DC voltage from the bridge rectifier, get a buck converter that will buck 12V to the measured voltage, connect the buck converter to the output of the bridge rectifier. You now have a 12V in - 36V out charger. thanks for the help. I really think i understand isolators and figure they are designed for high amperage alternators. I see now if I want to build and isolator for the solar panel charging i would not need as big diodes since the solar panel puts out way less amps than the alternator. I infer that is why the solar panels take a longer time to charge a battery than an alternator does. Regarding getting a a buck–boost converter, that is a great idea and saves me a lot of trouble. What an awesome idea. I knew there was something like this but just did not know the name. Thanks.